It's been a long time since I've read the Noble Dead series. Part of that was I don't like Wynn, Chane, and Shade as much as the original trio. They are pale reflections of the unique features that the original trio brought to the series. It's not that they don't have their own charm. Wynn is a scholar, a sage even, whose motivation in finding things out is to help save the world. In this her guild works against her because there are things that the guild thinks man is not meant to know and so it's a back and forth between her guild and the factions within it, including those that think, due to Wynn's tenacious nature, that she will find a way through to long-forgotten knowledge. There's there's Chane. Spoiler alert folks, he's a vampire who was killed early in the series by the former star, Magiere. She even went so far as to cut his head off. It didn't take but the decapitation left him a nice scar and a raspy voice. Oh, and he and Wynn have an 'unspoken thing' between them. You know, like Cheers. The last of the original trio is Shade, a fey hound of sorts that doesn't speak in words, but rather conveys things through memories. It works well in some points but also limits how the character can be used in terms of interaction with the others. 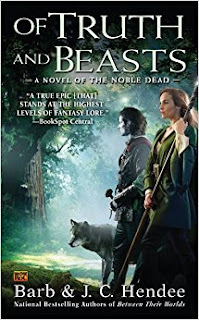 Having said that, since I haven't read any of the books in a long time, it was a pleasant read focused mainly on exploration and character interaction not only between the new trio, but also Ore Locks, a dwarf seeking redemption for one of his ancestors. Important when that ancestor is known as The Lord of Slaughter and you're not a worshipper of Khrone. Part of this back and forth involves trying to get permission to engage in the mission in the first place. The Sages aren't really keen on letting Wynn out of their sight but at the same time, if they banish her or try anything funky, well, there's the vampire dude and the dwarf and the fey dog... so many complications! Better to try and feed her a little information at a time and lead her in the direction they want her to go. But Wynn is not one so easily lead and quickly slips the leash taking limited funds and spending them all in an effort to get ahead of her own guild, which to a certain point works. The novel includes a few different factions that don't all get equal face time but it does give us a peak into the wraith, Sau'ilahk, a man who served the 'Enemy' because he thought he'd get to be young forever. Nope! Turns out they bound him after a long lived life and took his flesh so he's a formless, shapeless, black cape! He could be a super villain, "Fear the Wraith!" He's kind of annoying. When a villain gets a good death scene, go with it. And in the last volume, Sau'ilahk got that death scene. Bringing him back and giving him some more background and motivation works to a point, but it's also a mirror of bringing back Chane in previous volumes. "Kill your darlings" as the old saying goes. Having said that, the mix of exploration and character conflict comes to a nice climax in an ancient dwarf hold and the things in that old dwarf hold? Well, let's just say that fans of The Hobbit aren't going to be disappointed. The novel ends with an epilogue that sets up the next series in the Nobel Dead series. If you're a fan of fantasy exploration and standard races with a bit of a twist on them, like Ore Locks and how the dwarves in this setting work, you'll enjoy it. If you're looking for high action thought and intense combat scenes like David Gemmell or R. A. Salvatore or known for bringing to their series? Not so much. The Nobel Dead continues to move the plot forward with "the McGuffin" for at least another 'phase (3 even!) of five books so if you like your series long and epic, the Nobel Dead should hold you over.